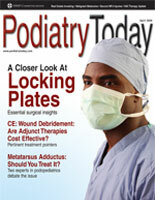 Lateral foot pain may be associated with problems of the lateral or medial foot. Often, if there is a problem on the medial aspect of the foot, your patient may also note that he or she has had long-term pain on the lateral aspect of the foot and ankle. Here is a common finding I see in my practice that may help you diagnose and treat lateral foot pain. A 58-year-old female has chronic pain in the lateral aspect of her right foot. She has had the pain for six months and says it has been getting worse in the past one to two months. She recently increased her level of activity with more charity work and has had more pain in the lateral foot region as a result. Prior to this increased activity, the patient spent most of her time in her garden on her knees and had limited her activity in the past few years due to periodic arch pain. While she notes a family history of flatfoot problems, the patient says no one in her family has had the same problems she has with ambulation. The patient says the pain only occurs with ambulation and subsides with rest. She has not found anything to help with the pain, although she notes certain shoes are more comfortable than others. She also reports periodic shooting pains on the lateral foot and has weakness of the entire foot associated with her low arches. The patient is a healthy, slim woman with no significant medical history. She takes estrogen and vitamins only. She has had two children with regular birth and no other surgical history. Vascular and neurologic examinations are normal. There is no loss of sensation to the foot and dermatome sensation is grossly normal. There is some shooting pain noted on the lateral aspect of the subtalar joint in the region of the sinus tarsi. This pain radiates into the medial sinus tarsi, which, upon examination, seems to be the most painful area. There is mild edema of the lateral sinus tarsi with a slight increase in edema of the peroneal tendons in the region of the sinus tarsi. The patient has grossly normal skin color with no discoloration or ulcerations. She does have an equinus with -5 degrees of dorsiflexion with the knee extended and 10 degrees of dorsiflexion with the knee bent. There is also weakness of the posterior tibial muscle, which is difficult to examine due to anterior tibial substitution during testing. On the lateral foot, there is mild peroneal spasm which is holding the foot in a pronated position. The peroneal tendons are painful to palpation on the lateral aspect of the posterior distal fibula. All other muscle groups are grossly intact in strength and function. The rearfoot is slightly stiff to range of motion at the subtalar joint. The subtalar joint is not painful to range of motion and there is no crepitus. I did notice an increase in rearfoot motion with decreased peroneal spasm after the patient relaxed. She also has increased midfoot motion with increased motion of the subtalar joint. There is no pain or crepitus in the midfoot joints at the midtarsal joint. Weight-bearing examination of the foot shows a severe heel valgus with peroneal spasm. There is an arch collapse with mild abduction of the forefoot at the midtarsal joint. The affected foot shows a greater level of valgus and arch collapse than the opposite foot. After asking the patient to do a bilateral heel raise, I noticed a very weak heel raise in which the heel remained in slight valgus without showing any varus. Single heel raise is negative with testing. Radiographs show a medial arch collapse at the naviculo-cunieform joint with a valgus heel and subsequent decrease in calcaneal height. The radiographs also reveal an adducted talus with unroofing at the talonavicular joint, and minimal degenerative changes of the rearfoot with no signs of stress fracture or gross fracture. The combination of findings from examination and radiographs are enough to rule out gross arthritic changes or degenerative joint disease causing the symptoms. Although there may be mild degenerative changes in the rearfoot, these are age-related and not part of the problem. The combination of examination and radiographs is also sufficient to rule out a stress fracture of the calcaneus. Although this may still be in the back of your mind, a good test is to squeeze the heel and see if there is pain. Using a tuning fork is another good test. If you are still questioning a stress fracture, you may want to get a MRI or bone scan to rule it out. It is fairly certain that the sinus tarsi syndrome and tendonitis of the peroneal tendons are secondary to another issue. The peroneal spasm and sinus tarsi symptoms in association with a collapsed arch and heel valgus should raise the possibility of posterior tibial tendon dysfunction. In the case of a chronic posterior tibial tendon dysfunction, you’ll see a lateral deviation of the forefoot at the midtarsal joint with heel valgus and possible peroneal spasm combining to result in sinus tarsi and lateral column pain. The process is much like controlling a horse. If you pull on one of the two reins, the horse turns towards the rein being pulled. With posterior tibial tendon dysfunction, the posterior tibial tendon does not function to support the arch or counteract the pull of the peroneal tendons. As the peroneal continues to pull on the foot without restriction, there is a valgus of the heel and forefoot abduction. This eventually causes spasm of the overpowering peroneals and sinus tarsi symptoms. The final stage of a non-functioning posterior tibial tendon is stiffness of the rearfoot complex. This patient’s foot is in spasm, but there is still joint mobility once the peroneal tendons are relaxed. If left untreated, stiffness may lead to more drastic surgery, such as arthrodesis, instead of performing a possible osteotomy now to correct foot position. Further testing is necessary for treatment. Obtaining an MRI is ideal as it will show the sinus tarsi region, posterior tibial tendon and help rule out fracture or stress fracture of the calcaneus. In this case, the patient had a longitudinal tear of the posterior tibial tendon. In addition, there was increased signal within the sinus tarsi and tendonitis of the peroneal tendons. Determining appropriate treatment for this patient may be difficult. After all, she is at an age (58) where two to three months of non-weightbearing is not easy or even possible. However, she is young enough that she would benefit from possible surgery to correct her foot position. The best treatment is to perform a course of physical therapy to decrease the peroneal spasm and relax the foot position. Then you can use a Richie-style brace and send the patient for gait physical therapy. This will help relieve symptoms and may make her feel much better. However, I would take the time to speak in detail about a reconstruction to this patient. In today’s society, a 58-year-old is young and still has a great deal of life ahead. At this point, a reconstruction may require limited arthrodesis or multiple osteotomies in association with tendon transfer to the posterior tibial region and lengthening of the Achilles tendon with a gastrocnemius recession. With time, arthrodesis will be the only option and the patient’s age may not allow for ideal results, if the condition is left untreated for another five to 10 years. I believe it is best to treat the patient surgically at this time in order to avoid the future complications. Although bracing may help, this modality is not well tolerated in the long term, and most patients will not stay with the bracing for life. What is standard and a must in all such cases is to decrease the pull of the Achilles tendon through either a gastrocnemius or Achilles tendon lengthening. In most cases, it is also necessary to perform a primary repair or tendon transfer in order to repair the posterior tibial tendon. Obviously, the type of surgical procedure will vary, depending upon the physician and the precise nature of the patient’s foot deformity. So remember to consider the patient, the whole foot and ankle prior to treating a problem without clear indication of the primary cause of that problem. Dr. Baravarian is an Assistant Clinical Professor in the Department of Surgery / Division of Podiatric Surgery of the UCLA School of Medicine.